Kozzmozz stands for pure uncut quality techno, brought to you by the cream of the techno crop. Solid line-ups, impeccable production, a beautiful venue and the best crowd any techno artist can wish for. If you were there last time, you know what we’re talking about. If this your first Kozzmozz, prepare to be blown away! That won’t be different this time with again the crop of the techno bunch with none other than Technasia heading the line-up. It has been quite a while since we had him over and both him and us, couldn’t be happier. He may start to play for Cadenza in Ibiza this summer but no worries, he knows that Kozzmozz likes their beats with a bang and he sure still knows how to bring those also. He has travelled the world as a major player in the techno-scene for 13 years now and his Sino label is well regarded as a quality label with integer artists. A London native and in the music business for more than 15 years now, James Ruskin is considered as one of the main artists in British electronic dance music. With his releases on Blueprint, Coda and Tresor he set new standards in production techniques and he has an excellent worldwide reputation. James´ DJ skills and his many top-notch productions, both old and new, have secured him a number of international slots throughout the world. He played at the world´s best venues, such as La Real (Spain), Tresor & Berghain (Berlin), U60311 (Frankfurt), to name but a few. His last album „The Dash“ was released on Tresor in 2008. He also teams up with Regis for the brilliant O/V/R project. From Berlin’s leading techno club Berghain, we welcome Marcel Fengler who has been giving underground techno parties with Marcel Dettmann since the late nineties. He was a Tresor resident but moved to Berghain in 2004. His productions are uncompromising and pure techno delights. His releases on Ostgut Ton are praised by many and strengthen his position as an innovative producer. He also released on Luke Slater’s label Mote Evolver and recently set up his own label Index Marcel Fengler. Finally he also contributed to the Berghain mix compilation by delivering an essential dj-set for the 5th instalment. Pure quality techno all the way from 3 well established artists who will bring us the most innovative sounds of today. They will get the full support of our residents Kr!z and Spacid who know how the rock their crowd like true residents do ! 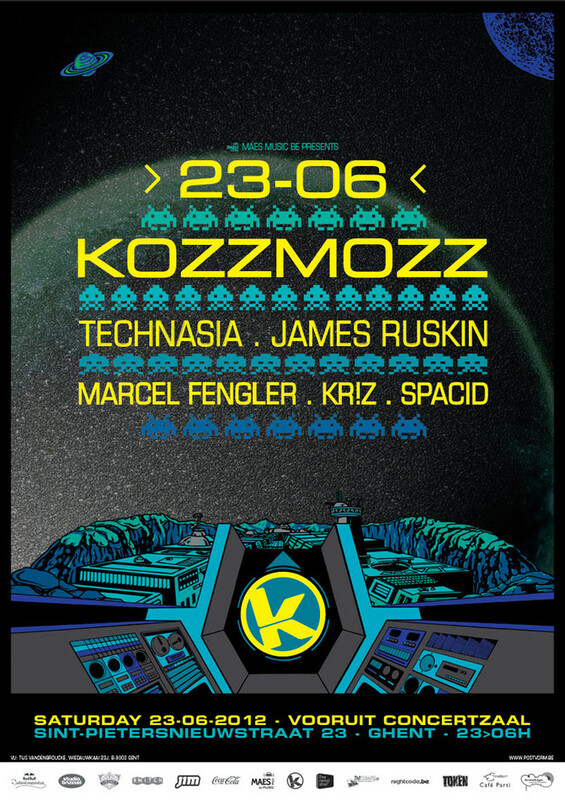 Prepare for another spaced out Kozzmozz voyage and lift off !